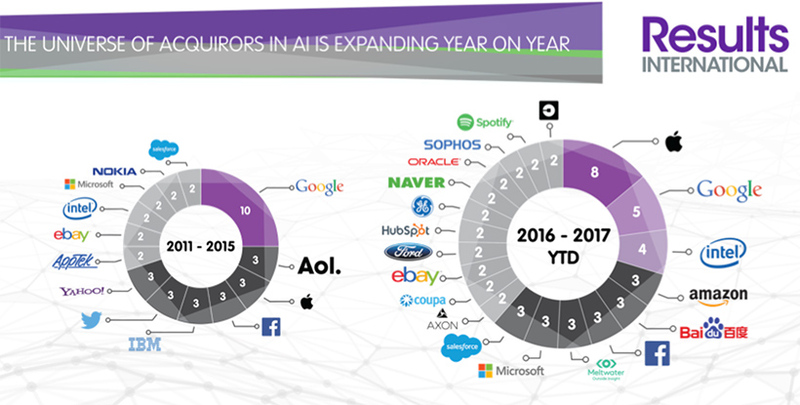 There have been 98 M&A deals involving artificial intelligence businesses so far this year, up a third on 2016 and double the number in 2015. 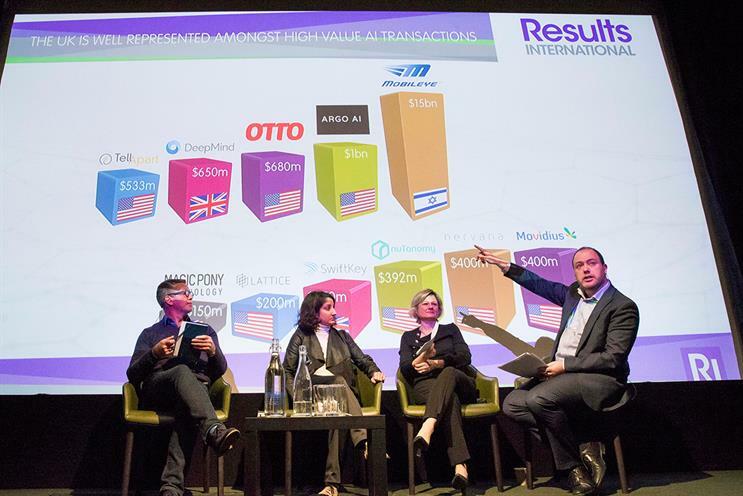 "It is not just the big tech giants buying into this space," Julie Langley, partner at M&A firm Results International, told a Campaign breakfast briefing, called "Profiting from AI: the business opportunity". There were 74 deals globally in 2016 and 44 in 2015, according to an analysis of M&A compiled by Results International. Looking at deals since the start of 2016, big tech companies such as Google, Amazon and Apple were responsible for about one third of the 170 transactions involving AI. The other two-thirds were done by "a whole range of companies", Langley said, pointing to how the number of acquirers is broadening. "Everybody recognises whether I’m a company in manufacturing or HR or advertising, I need to be building AI into what I offer." 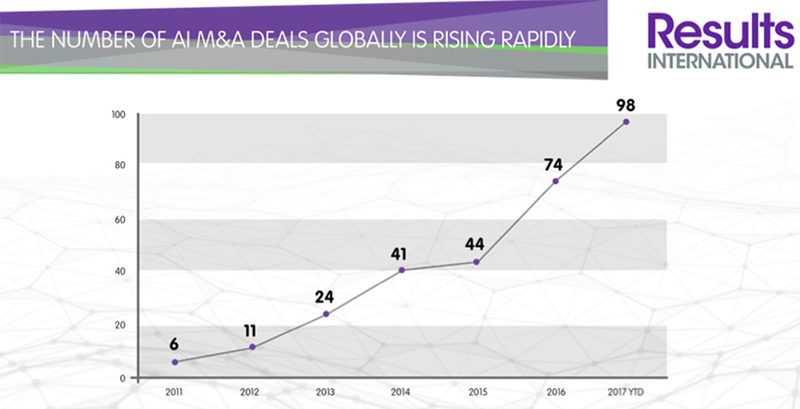 The number of M&A deals in AI is likely to increase in the next few years. "There are about 400 early-stage AI businesses in the UK alone," Langley said. Many of the acquisitions that have taken place in the last two years were of specialist businesses with sector-specific capabilities. 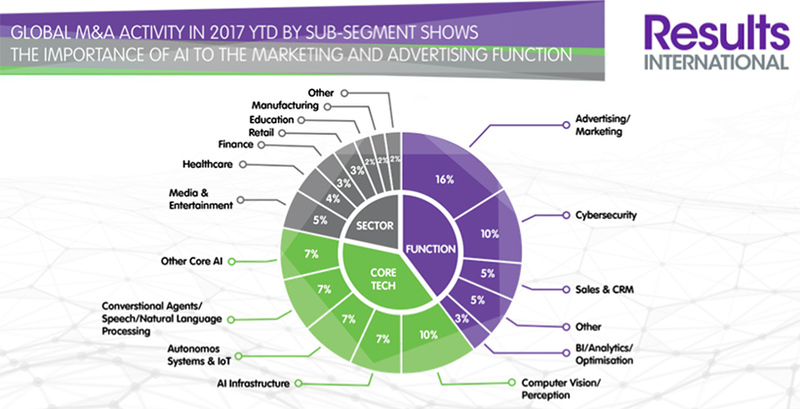 "Only about a third of transactions are in what we call ‘core AI’ such as autonomous cars or the internet of things," Langley said. "Most of the transactions that are happening are for companies that have developed point solutions for a specific vertical such as media and entertainment or healthcare or finance or a specific function such as advertising, sales, CRM or cyber-security. "That is where I think the huge opportunity is and where start-ups and entrepreneurs can really compete with the Googles and Amazons and Apples." She cited Twitter’s 2016 acquisition of Magic Pony, a UK start-up that specialises in compression technology for live video streaming, in an estimated $150 million deal. Twitter was not only buying engineering talent with the Magic Pony deal but also a "very specific solution" for its business needs, Langley said. Steve Hyde, chief executive of 360xec, a headhunting firm, and chairman of Iotec Global, a media-buying platform that uses machine learning, warned the continued rise of the big tech giants is affecting the market because they have such deep pockets. Recruiting engineers, in particular, is "very tough" as "demand massively outstrips supply", which explains why Google bought Deep Mind Technologies in an estimated $650 million acquisition in 2014. Hyde said the rise of AI and advances in technology have wider implications for businesses which must think about their leadership structure and find senior executives with new skills and capabilities. "You’re going to see a transformation of structure," he said. "The challenge is to find those people who can help transition businesses from where they are to where they need to be. "The whole communications industry is going to go through such substantial change that you need to look at those senior individuals who have the capability to bridge across [and be able to reshape a business]." Tini Sevak, global director of data application at YouGov, the insight and analytics firm, said there is a "trade-off" when it comes to talent recruitment and retention. Companies probably need to adopt a strategy that is a mixture of "buy, build and borrow" as they embrace technology, automation and AI, she said. There are benefits of trying to "upskill" and "reskill" existing talent because "they are embedded into the strategy and the culture", Sevak said. YouGov has made its name with political polling and a data-modelling technique called multi-level regression and post-stratification (MRP), which correctly predicted the last UK general election result. "The next phase [with MRP] is to see where does this go with media," Sevak said, but she cautioned that analysing consumers for marketing purposes is more complex than a binary decision about their voting intentions. "The hard thing is in the media world there is not a binary choice with a creative or media strategy" because a brand may have a range of objectives such as driving awareness, consideration, engagement, brand love and so on, she explained. What’s more, media plans tend to be locked in and are hard to change at short notice on "an hourly or daily basis", she said, adding the media industry is "not there yet". Langley said marketing and technology may be blurring but she doesn’t expect a traditional enterprise software company to buy an ad agency group because they have different business models. However, she said agencies are likely to face growing competition as AI becomes more important. "Software companies are looking at the marketing budget and seeing it as a very big target for them," Langley said. "As more of the marketing function gets done by technology and by software – and media-buying is the first, big function to be slowly going in that direction – I think a large enterprise vendor sees the opportunity to take large parts of that budget." Does AI put customers first or last?